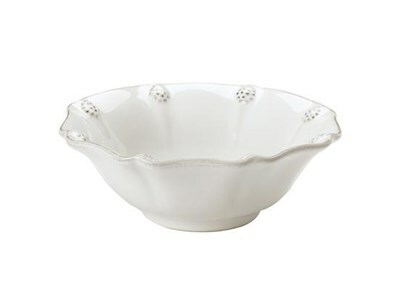 From the Berry and Thread Collection - We've dressed this Ruby Red Berry Bowl with charming details - ruffled fluting, a scalloped edge, and a sprinkling of berries. Perfect for nuts at the fireside or candies on your desk. This ceramic stoneware is made in Portugal and is oven, microwave, dishwasher and freezer safe.